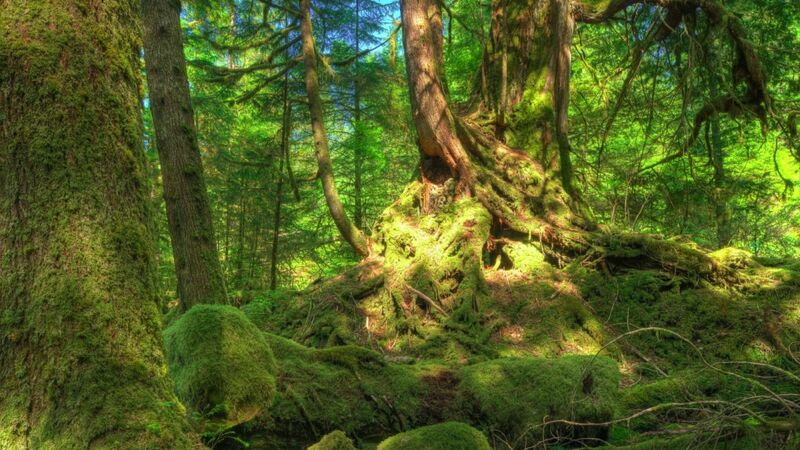 The Islands of Haida Gwaii (formerly the Queen Charlotte Islands) are one of the richest biological and cultural areas in North America. 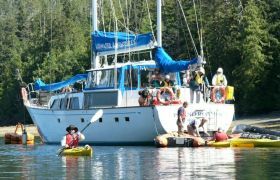 Aboard our 68’ sailing vessel, we will cruise the waters of this remote archipelago seeing ancient Haida villages, an incredible abundance of wildlife and outstanding wilderness scenery. 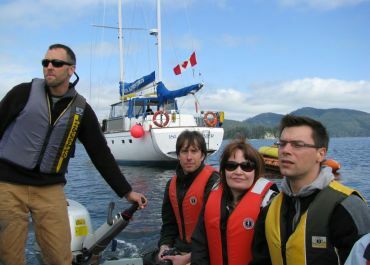 In June 2010 Canada’s first marine protected area was announced surrounding the islands. 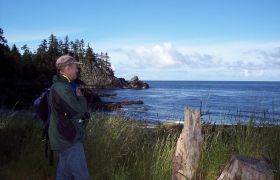 Our trips primarily explore the eastern & southern shores which lie within the Gwaii Haanas National Park Reserve & Haida Heritage Site. 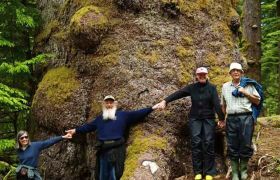 Gwaii Haanas is a incredible area with over 100 islands, beautiful forested creek walks, rugged headlands, and protected passageways between towering mountains. Thousands of seabirds nest on the islands. 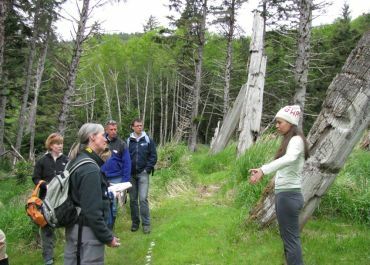 Theories suggest that parts of Haida Gwaii escaped the last ice age, forming a glacial refuge for certain plants and animals. 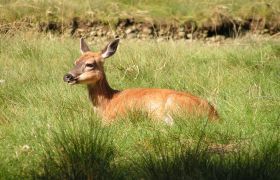 How else to explain the presence of plant species found nowhere else in the world and the noticeably different sub-species of bird, fish and mammal? 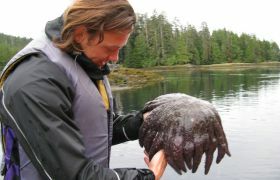 Haida Gwaii provides a remarkable evolutionary showcase - hence, their description as the “Canadian Galapagos”. 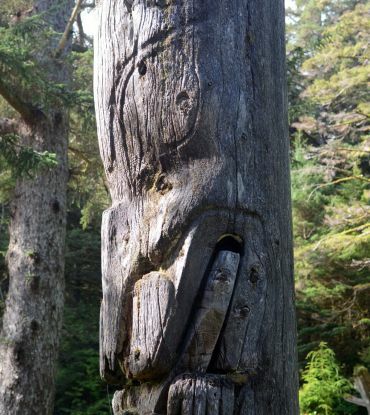 Ancient Haida villages, impressive pole carvings, Unesco World Heritage site, learning the Haida story through Haida people, abundance of wildlife, massive trees, Hotspring Island - just a few reasons we spend 4 months in the southern islands of Haida Gwaii. 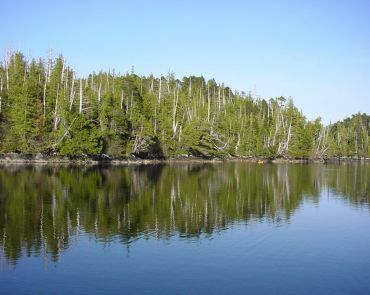 The Haida name for the southern islands, Gwaii Haanas, appropriately translates to “Islands of beauty” or “place of wonder”. The islands are protected from the ocean floor to the mountain tops and are accessible only by float plane or boat. 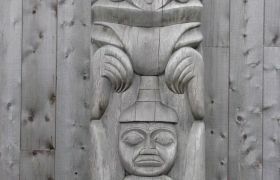 Haida Gwaii is home to the Haida - one of the most culturally rich and developed groups of people to inhabit early North America. 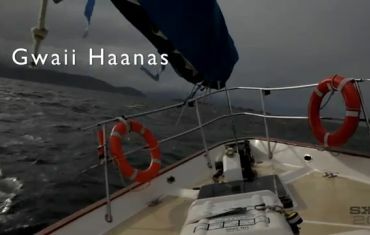 The Haida name for the southern islands, Gwaii Haanas, appropriately translates as “islands of beauty” or “place of wonder”. 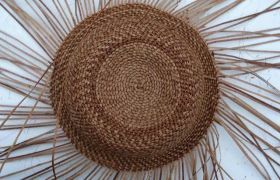 Among the southern islands are many ancient villages - K’uuna (Skedans), Cumshewa, T’annu and SGang Gwaay (Ninstints). 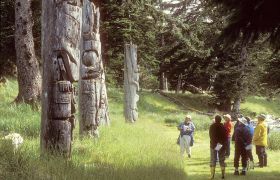 These sites contain the remains of the great long houses and the best remaining examples of original totem poles in the world. The United Nations has recognized the cultural value of these sites and designated SGang Gwaay as a “World Heritage Site, of importance to the history of mankind”. 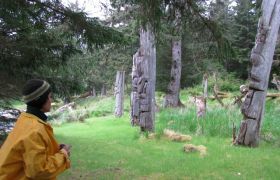 For many people, the highlight of their trip is the opportunity to listen to a Haida story and learn about the traditional and modern Haida way of life. 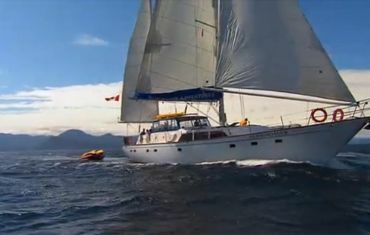 A sailing voyage to Gwaii Haanas provides the rare opportunity to explore a pristine wilderness region. These islands are an isolated archipelago, difficult to reach and rarely visited. Access is possible only by boat or charter float plane. We travel ashore in our inflatable zodiacs which enable us to pull right up on to the shoreline. We will walk beaches that may have seen no other footprints that year and may even find Japanese glass fishing floats that have washed ashore. 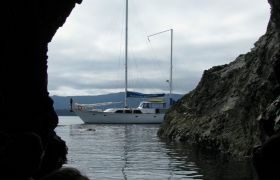 We will anchor in secluded bays and expect to see few other people as we explore this remarkable wilderness area. 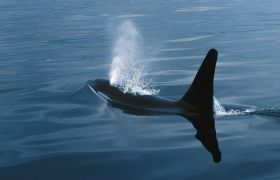 Blue, sperm, minke, sei, gray, fin, humpback and killer whales (orca) all historically frequented these waters. Local whaling severely effected these populations in the 1900’s. 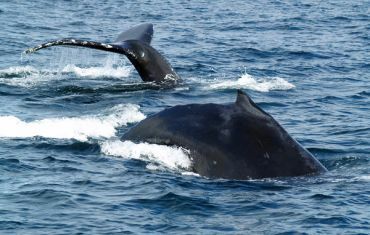 Now humpback and fin whale populations are rebounding; we will often encounter these fascinating creatures. In early summer, several thousand Steller sea lions also congregate at Cape St. James - at the southern tip of Haida Gwaii - to mate and give birth to their pups. It is quite a marvellous sight! 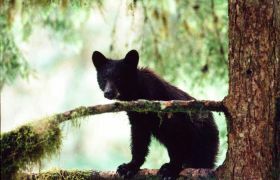 You may also spot a few Queen Charlotte Islands black bears, the largest black bears in the world. 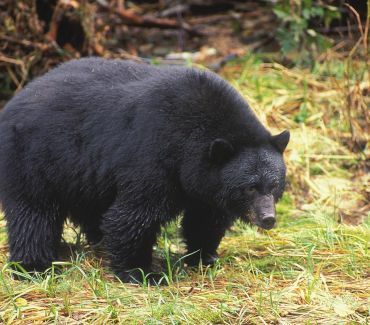 Through isolation from their mainland cousins these black bears have developed a larger lower jaw because of frequent foraging and feeding along the shoreline. Interesting birds will be with us throughout these trips. 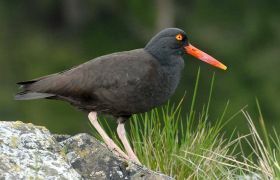 Some of the more colourful species include tufted puffins, horned puffins, rhinoceros auklets, black-footed albatross, black oystercatchers, and pigeon guillemots. With such abundant bird life, raptors, such as the peregrine falcon, are common in Haida Gwaii. 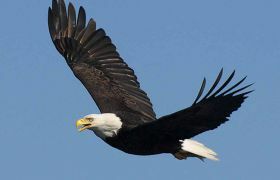 The concentration of bald eagle nests along the coast is second only to Admiralty Island in Alaska. 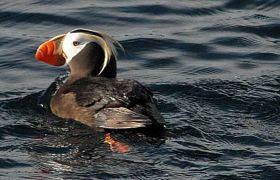 Our constant companions will be the smaller seabirds such as ancient murrelets, marbled murrelets, common murres, phalaropes, and gulls. Watch and listen to the tiny ancient murrelet chicks hatch and join their parents at sea in May! 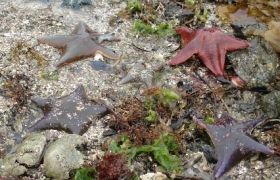 With our naturalist, we will also explore intertidal areas to find many varieties of sea stars, giant barnacles, mussels, clams, snails, urchins, crabs, sponges, chitons, sea cucumbers, nudibranchs and a wealth of other colourful and interesting creatures. We will be soaking in the picturesque scenery on the beautiful Hot Springs Island. 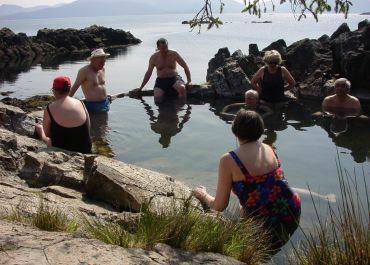 In 2012, there was earthquake recorded of the coast of Haida Gwaii which dried up the hot pools and rendered them cool. Each year since, the pools have been returning. 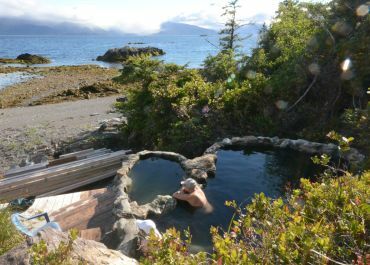 With the Haida Watchmen working at rebuilding the pools in a slightly different locale, guests are again able to enjoy a soothing soak while gazing out across the water at the San Cristobal mountain range - delightful! 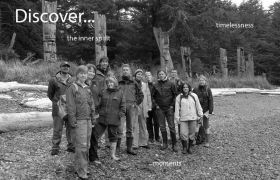 See our 4-page brochure on Haida Gwaii. Specific highlights planned include: T’aanu, Burnaby Narrows, Rose Harbour, UN World Heritage Site of SGang Gwaay, Hot Springs Island, windswept Skedans (K’uuna). On all our voyages we intentionally keep our itineraries flexible to take advantage of wildlife sightings, weather & tides, and the interests of the group. Arrival Day - Guests fly into the Sandspit Airport from Vancouver (Air Canada) the day before their trip starts - not included in price. Overnight at the Sandspit Inn - included in price. Day 1 - Breakfast at Sandspit Inn. 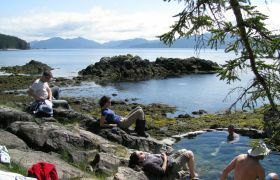 On most departures we then transport you to Graham Island for a tour of the Haida Heritage Centre and a traditional Haida lunch. 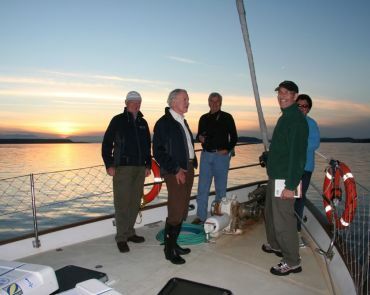 In the afternoon we travel to Moresby Camp to board Island Roamer, enjoy dinner and start our voyage. Days 2 – 7 - We will spend our time exploring the eastern and southern shores of Moresby Island. 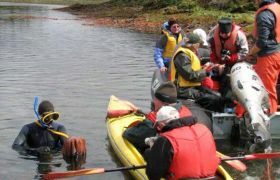 Daily activities include wildlife watching, shore excursions to explore ancient Haida villages, old growth forests, beautiful creeks and shoreline, and intertidal zones. 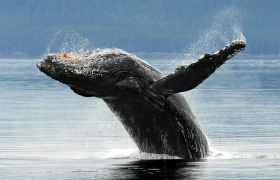 We aim to spot humpback whales, porpoise, dolphins, sea lions and orca. 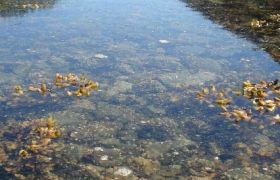 We’ll search the shoreline in hopes of spotting a few Gwaii Haanas black bears foraging for food and we will be amazed by the myriad of intertidal creatures found in the nutrient-rich channels. Day 8 - Mid-morning departure at Moresby Camp. The charter bus will meet participants and return them to the Sandspit Airport to catch afternoon flights back to Vancouver. *If your tour is a 9 day tour, there will be more time spent at above places. 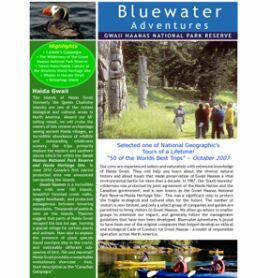 Download your 5-page sample itinerary for trips to Haida Gwaii.